If you have received a letter from the New York State Compensation Rating Board alerting you that you are now part of Industrial Code Rule 59, I would imagine that you may have a few questions. It is our hope that this blog can assist you in making sense of the program and while you are here, get a quote from GCG Risk Management to perform your Code Rule 59. The program is required for all New York employers whose most recent annual payroll is in excess of $800,000 and whose most recent experience rating exceeds the level of 1.2. Employers who meet these criteria are notified by the New York Compensation Insurance Rating Board of the need to undergo a Workplace Safety and Loss Prevention Consultation. These notifications become effective on the day each employer receives the notice in the mail. The consultation shall include a review of the employer’s safety program and a hazard survey of the workplace. The consultation must be performed by a consultant certified by the New York State Department of Labor. This is where GCG Risk Managements’ Team of Safety Professionals can assist you. With years of experience in both Insurance and Occupational Safety, GCG Risk Management is the obvious choice for your Consultation needs. At the conclusion of the consultation, the consultant will submit a written evaluation to the employer. Anything listed as a Recommendation must be completed within 6 months of receiving the report. Common findings include Safety Committees, Written Safety Programs, Management Safety Programs, and the correction of Physical Safety and Health Hazards. Policies in non-compliance receive a 5% surcharge for each year they are in non-compliance. Table Based on Receiving the Notice on 4/2, actual timeline is based on date the notice is received. Numerous factors go into determining the cost of Code Rule 59 Consultations; including number of locations, size of employer, abatement services, industrial hygiene fees, and location of employer. To get a quote from GCG Risk Management request a quote and you will be contacted quickly with a quote. There is really no interesting way to say this so we’re just going to have to throw caution to the wind and blurt out that it’s February and time for employers to post their OSHA 300 Logs. We at GCG were on pins and needles as the Academy Award nominations were revealed, and we were saddened to find that our newly released Webinar entitled “OSHA 300 Log Recordkeeping – Breathing Lessons in Tedium!” was not listed in any category. We urge you to check out our Webinar on YouTube, available at http://www.youtube.com/watch?v=9QoIR7ImA3g. No sign-in is necessary. Just click the link, watch, listen and learn (please note this link will not come up on a YouTube search, as it is not “public” but rather “unlisted”). In the event you don’t have time to view our production at this moment, we’ve printed up the basics for you. Privately scheduled live-webinar sessions of this topic is available to our clients. Please contact Elsie Tai at elsie.tai@gcgriskmanagement.com if you would like to schedule a live session at your convenience for your staff. What to Post – Don’t wait for Presidents Day! February is OSHA posting time, and employers are required to fulfill the OSHA requirement and post the OSHA 300A Summary of the OSHA 300 Record of Injuries & Illnesses Recordkeeping Log for the past year (2012). This posting must be done for the period February 1st through April 30th inclusive. The posting must be in an area accessible to all employees. Total Number of Recordable Cases: These involve all workplace incidents which require “medical treatment” beyond OSHA’s strict definition of “First Aid”. OSHA’s definition of “First Aid” is NOT the same as that which you may use for non-reportable Workers’ Compensation claims. As a result, if you routinely pay out-of-pocket for Workers’ Compensation First Aid Cases, BEWARE, OSHA’s definition of First Aid is far more conservative. There may be First Aid cases which are in fact OSHA reportable, but which you have considered First Aid under your Workers’ Compensation program. Total Number of cases involving Days Away from Work (DART): These include Loss of Time, Restricted Motion or Job Transfers. What You’ll Need – Two Aspirin and a high school student who has studied Algebra. Seriously, you will need to locate your Actual hours Worked by your employees in 2012 in order to calculate the rates for both categories of Total Recordable Cases (i.e. both categories above). Be sure to include overtime (at time and a half rates), but not reduced pay, double-time or triple-time. Count only actual hours worked. You need to ensure you have an OSHA 301 or equivalent Incident/Accident Reporting Form for each case entry, as well as all other attending documents related to the reporting of each case. If you have had a needlestick injury (OUCH! ), you should also be keeping a Sharps Injury Log. Finally, you should be keeping a Privacy Log (SHUSH! ), if you have had any of the following: needlestick incidents, bloodborne exposure incidents, sexual assaults, episodes of mental illness, HIV/Hepatitis/TB Infection, or anything an employee can reasonably ascertain to be a “privacy case”. For a sample Sharps Injury Log or Privacy Log, sign in to our website at http://www.gcgriskmanagement.com and click on “Resource Library” and scroll down to “OSHA Recordkeeping or you may go to http://www.gcgriskmanagement.com/safety-resources/osha-recordkeeping once you are signed in to our website. If you have not yet obtained a username and password in order to access the private Resource Library available only to GCG clients, please contact Angela Goff at angela.goff@gcgriskmanagement.com or call her at 1-800-638-8048 or 518-370-3303, ext. 8811. GHS means changes for manufacturers, transporters and users of hazardous chemicals in the United States. Safety Data Sheets, labels and chemical classification will be revamped. During late 2011 and early 2012, OSHA implemented new regulations on chemical safety data which have been adopted from GHS standards set forth by the United Nations as a way to bring into conformity the chemical regulations and standards of different countries. The UN’s GHS was an international attempt to get everyone on the same page. The hope is that every country will integrate the GHS concept into their own chemical management systems with the goal of making the international sale and transportation of hazardous chemicals easier, as well as, making workplace conditions safer for all employees exposed to chemical hazards. The U.S. officially adopted the GHS on March 26, 2012. OSHA’s adoption is actually a revision of the HCS (Hazard Communication Standard) to align with the GHS. OSHA calls this revision, “HazCom 2012”. HazCom 2012 is expected to affect every U.S. workplace with exposure to hazardous chemicals, ultimately covering over 5 million facilities and over 40 million workers. Compliance deadlines also affect chemical manufacturers and distributors. June 1, 2015 – Manufacturers and Distributors must comply with the revised HCS. This includes reclassifying chemicals and producing GHS formatted labels and SDS’s. Distributors get an additional 6 months to distribute old inventory already labeled. June 1, 2016 – Employers must fully comply with revised Hazard Communication Standard, the Hazcom 2012, complete training of employees on newly identified hazards and any updates to all new Safety Data Sheets and uniform labeling systems. The most noticeable changes brought by GHS for most organizations will be changes to hazard classification, labels, safety data sheets, information and training. Hazard classification: The will be a new system and set criteria for classifying the hazardous properties of chemicals. This classification system offers very specific instructions as to the classification of any and all health and physical hazards in additional to mixtures’ classifications. Labels: Under the new labeling system all chemical importers and manufacturers will be expected to utilize labels that include a signal word, pictogram and hazard statement from the new harmonized system. However, it is unlikely OSHA will require chemical manufacturers to produce SDSs for discontinued products, so employers will be responsible for determining GHS labels for older products. SDS: Safety Data Sheets will have a 16-section format. Communicating hazard information in a prescribed and uniform way on labels and safety data sheets. One of the key challenges will be an employer working with their chemical product vendors to produce the SDSs in a timely manner. Information and Training: Employees will need to be educated on the label and MSDS changes to SDS due to the updated product classifications, pictograms, signal words and precautionary statements. Written programs will need updated to include changes to labeling, SDS communication and employee training. Training employees and updating the written program may require significant resources and should occur as soon as the organization begins its GHS transition. OSHA is only modifying those requirements of the HCS that must be changed to align with the GHS. The main agenda will remain the same. Chemical manufacturers and importers will continue to be responsible for providing information about the identities and hazards of the chemicals they produce or import. All employers with chemicals in their workplaces will continue to be responsible to have a hazard communication program and provide information to their employees about their hazards and protective measures. Under HCS, variations between national and international laws create a regulatory and compliance disaster that disrupts commerce and compromises safety. The discrepancies burden manufacturers, importers, distributors and employers. By standardizing the components of various systems, the GHS will protect workers, consumers, emergency responders and the public by creating a comprehensive system through which chemical hazards are identified and communicated to all who are potentially exposed. Furthermore, global adoption of GHS is expected to reduce costs and inefficiencies associated with the international trade of chemicals. OSHA anticipates the revised standard will prevent 43 fatalities and 585 injuries annually, with a net annualized savings of over $500 million a year. GCG Risk Management Clients receive webinars, tool box talks and PPTs on this subject. For further assistance or comments clients may contact Elsie Tai at Elsie.tai@gcgriskmanagement.com, 212-431-3000, ext. 8456 and Rudolph Lu at rudolph.lu@gcgriskmanagement.com, 518-370-3303 ext. 8816. If you are interested in receiving this type of assistance as part of your Workers Compensation Program request a quote. If you are interested in obtaining Health and Safety Consulting Services request a quote. GCG represents furniture manufacturers, assemblers, and millworkers as manager of the Furniture Manufacturing Safety Group #467. For over 50 years, this group has provided safety and savings to the furniture manufacturing industry. On August 9th, 2012 a 25% dividend was paid to members for the accounting period 10/1/2010 -10/1/2011. Congratulations to all the member companies for a great year. If you are interested in the safety and savings provided to members of Safety Group #476 please take a look at the links below. Formed in 1936 Scrap Iron & Steel Safety Group #88 is still going strong approaching its 76th year. There are only three other NYSIF Safety Group Programs older that Safety Group #88. 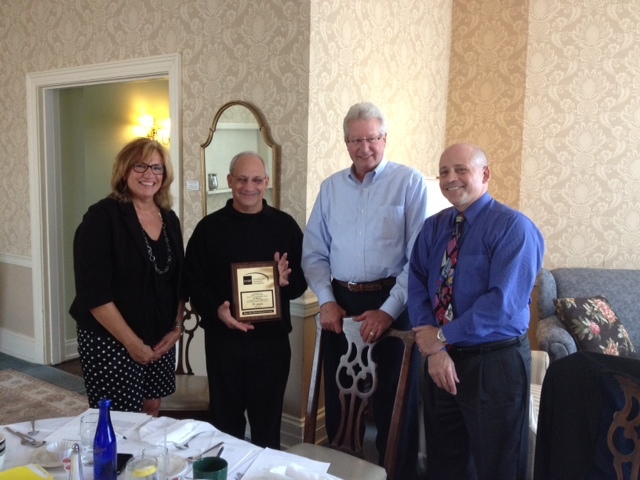 NYSIF Field Service Supervisor, Mary Lou Angarano presents a plaque for this achievement to Chairman, Steven Kowalsky of Empire Recycling, Vice-Chairman, George Stanton of Roth Steel Corp. and Group Manager, Ross Gnesin of GCG Risk Management, Inc. The program continues to grow today and has benefited from loyalty of its members. Keep an AED handy in the workplace; the life you save may be your own! An AED or Automated External Defibrillator is a portable electronic device used in emergencies involving a life threatening cardiac event. An AED is designed so that an 11-year-old can properly and effectively use it to apply electrical therapy to the heart to reestablish an effective rhythm, or in essence, stop a heart attack in progress and save a life. The AED is very similar to the electrical paddles, used by medical professionals, on a patient’s chest, to restart the heart in medical emergency scenes presented in movies and TV shows. The AED is the same type of equipment, but it is designed to allow a lay person, with very basic training, to use it when Emergency Responders are not available. The equipment actually diagnoses the heart rhythm itself and applies a shock when needed. Audio directions are issued to the user, from the AED device, to give guidance on the proper operation of the device during such events. According to the Occupational Safety & Health Administration, approximately 10,000 Cardiac Arrests occur in the workplace each year. However, there is only a 5-7% survival rate, due to the time it takes for emergency responders to reach the scene. Studies reflect that the use of AED’s increases the survival rate to 60%. Earlier this year, the CFO of one of our clients was working at his desk when he suffered a massive coronary. For all intents and purposes, he had passed away. A co-worker spotted him just as it happened, grabbed the AED, and “brought him back to life”. After a recovery in the hospital, the CFO is now “alive and kicking” thanks to the quick action of his co-worker. The irony is that the CFO had thought the device too expensive prior to purchase, but the President of the company overrode his decision and purchased the AED. Now they are purchasing a dozen more for all their locations. Have a Medical Professional oversee the program. Purchasing an AED requires a prescription. This is very easy to obtain from the suppliers. Notify your local EMS Responders that you are using an AED. Select, Place, and Maintain AEDs – Chose the right AED, place it in an accessible area, and provide the very simple maintenance to ensure that the AED is functioning correctly. Most important is to make sure the batteries are charged at all times, or the AED is rendered useless. Training likely responders. Training on AED use is integral to ensure employees can properly use its life saving features. Automated External Defibrillators are now considered so easy to use that New York State has included AED’s under the “good faith” clause in the Good Samaritan Laws. “Good faith” protection under a Good Samaritan law relieves volunteer responders (not acting as a part of one’s occupation) from civil liability for the harm or death of a victim if they provide improper or inadequate care, given that the harm or death was not intentional and the responder was acting within the limits of his training and in good faith. New York State and municipalities within the State have passed legislation to require AED’s in certain types of buildings including large schools, health clubs, government institutions, and public buildings with large capacities. AED’s are not required to be available in most workplaces, but that does not mean that they cannot be a major part of your Safety Program. Of course, there are costs associated with AED’s, including equipment, employee training, and replacement parts. However, the investment could mean saving the life of your employees, your customers, or even yourself. The maximum weekly compensation benefit has increased incrementally from $400.00 per week to $772.00 per week. Medical treatment guidelines were enacted effective December 1, 2010, to control medical care for the back, neck, knees and shoulders. Benefits for Permanent Partial Disability (PPD) claims, among the most costly of all Workers’ Compensation claims, were capped at between 225 and 525 weeks of duration, based upon the loss of wage earning capacity. These factors combine to form the claimant’s “Loss of Wage Earning Capacity”. Since Permanent Partial Disability (PPD) claims are among the most expensive claims that a business can face, new forms have been developed to quantify the injured worker’s loss of wage earning capacity. Completion of these two forms is critical to the defense of the claim. Therefore, we urge you to adopt these forms into your record-keeping protocols immediately. The Vocational Data Form should be incorporated into your personnel files. Workplace supervisors should become familiar with and be able to promptly complete the Functional Capacity Form for all reported claims. A more detailed explanation follows. When a claim is in the PPD classification process (i.e. when the claimant reaches maximum medical improvement, usually 6-24 months after the date of accident), the claimant will be asked to complete an official Workers’ Compensation Vocational Data Form (VDF-1). This form specifically outlines the claimant’s educational history, special skills, work experience and knowledge of the English language. Accordingly, the less education, special skills, work experience and knowledge of the English language the claimant has, the larger the loss of wage earning capacity will be. 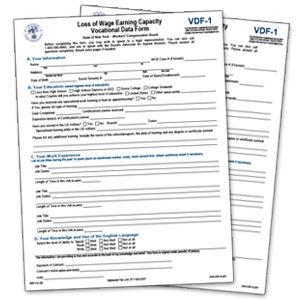 The questions on the Vocational Data Form reflect the information that the claimant will be required to complete in order to establish his or her loss of wage earning capacity. We strongly recommend that the Vocational Data Form be filled out as part of the employment application, for all new hires, and for existing employees to the extent that it is practical. The completed form should be kept in the employee’s file, until such time as a Workers’ Compensation claim arises (hopefully there won’t be one). If there is a claim, the completed form should be provided as part of your First Report of Injury (FROI). Should there be a discrepancy between the two forms at the time of PPD classification of the claim by the Workers’ Compensation Board, the carrier/employer will then be in a position to rebut any attempts by the claimant or his attorney to argue for a higher loss of wage earning capacity on the basis of the employee’s submission of the VDF-1. During the process of determining loss of wage earning capacity, a claimant must undergo a physical test called a Functional Capacity Examination. This examination is performed by a doctor of the claimant’s choosing. It is designed to measure the functional capacity of all physical movements the claimant may be required to perform in the workplace. Absent any information from the employer, the claimant is free to explain to his doctor all the requirements of the job at the time of the injury. Furthermore, there is nothing with which to compare the claimant’s functional capacity post-recovery to what it was prior to his injury. In order to assist in the defense of a claim, the injured workers’ supervisor should fill out the Functional Capacity Form as part of the Accident Report. Completing this form is your chance to explain to the Workers’ Compensation Board what the claimant’s exact physical requirements are as part of his job. In doing so, you will not only prevent the claimant from having the only say with the attending physician as to what his job duties are, but you will also provide the Workers’ Compensation Administrative Law Judge with a basis for comparison of the claimant’s current post injury functional capacity. This is a valuable tool for the Administrative Law Judge who will ultimately determine the loss of wage earning capacity of the claimant. It will also help limit the portion of the loss of wage earning capacity that can be related to functional capacity. We are available to answer any questions, to review your existing protocols, and to provide orientation training, either on-site or via conference call. Our staff will help you integrate, understand, and apply maximum leverage with these forms, and implement new strategies in the face of these changes in the Workers’ Compensation system. We will make available a webinar on a CD as well as a YouTube format online, very soon. To obtain copies of the forms you may call (518) 370-3303, ext. 8814 for Sheri Kosloski, or by email at sheri.kosloski@gcgriskmanagement.com. These new forms can also be accessed on our website at www.gcgriskmanagement.com, under “Claims Management” in the Resource Library, once you log in with your username and password. If you’ve forgotten your username and password, or have not signed up for one, please contact Angela Goff at (518) 370-3303, ext. 8811, or by email at angela.goff@gcgriskmanagement.com. For a copy of the CD-Rom when it is available, please contact Elsie Tai at (212) 431-3000, ext. 8456, or by email at elsie.tai@gcgriskmanagement.com.